MailClark Help Center - What different status can you use to manage your emails? All Categories ​>​ About MailClark ​>​ What different status can you use to manage your emails? With our newest version of MailClark, we optimized the collective email management in Slack or MS Teams. All received emails can be now assigned, receive the status and have reminders set up. Let's make a quick tour of this enhanced features in MailClark ! This is the moment to decide who is in charge of this message (not assigned yet). If no action is taken on the message, a reminder will be posted in the channel after 24h (You can also customize this delay). As soon as someone replies to the message, this person is automatically assigned. The message has been assigned to you or one of your team members and s/he must take action on it (e.g reply or mark the message as done). If no action is taken on the message, a reminder will be sent to this person after 48h (in a Slack DM/ Teams Chat with MailClark). Conversely, the emoji 🔇 means that your message wasn't sent. The message was replied to, but you expect the conversation to continue. If no reply is received after 3 days, an invitation to follow up will be sent in a Slack DM/ MS Teams Chat to the person assigned to this conversation. If a new message is received, the conversation will be back to the "Action required" status. The conversation comes to an end. Mark the conversation as done to let your teammates know it has been taken care of. Since you've been using MailClark for a while, you might be used to open the email in the browser by clicking the subject. 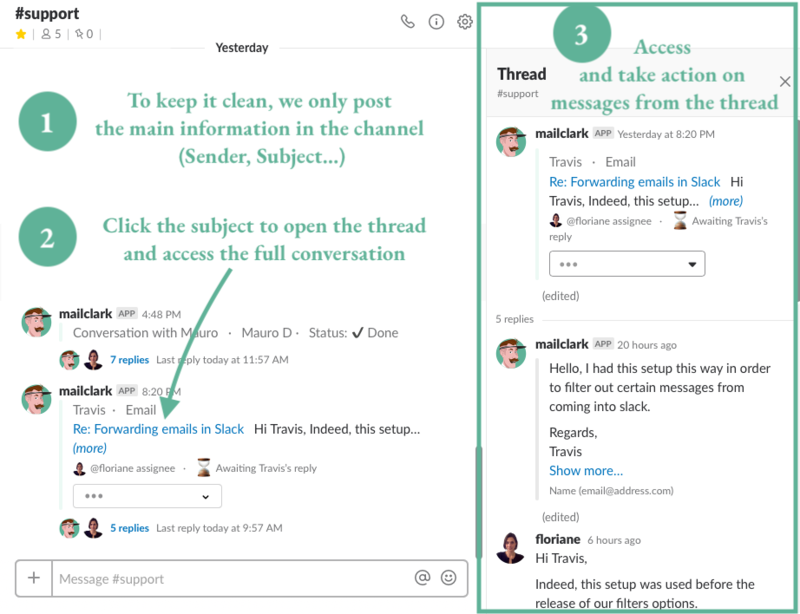 With this new version of MailClark, we wanted to confirm the idea that with MailClark, you no longer need to leave Slack. That's why the subject now open a thread, where the whole conversation is posted. You still have the possibility to open the email in your browser, by clicking "sender name (email@address.com)" under the message in the thread. Why should I use MailClark for MS Teams?